Fortune 500 organizations across all industries are transforming into software-based businesses to compete in quickly changing markets. Organizations are adopting agile practices as well as new technologies with a focus on delivering more software at a faster rate than ever before. As these organizations search for tools to enable their digital transformation, they increasingly land on containers as a technology to enable that shift to cloud native application architectures. Cloud Foundry Foundation engaged ClearPath Strategies, a strategic consulting and public opinion research firm for the world’s game-changing political and technology leaders, to conduct a first-of-its-kind, multi-national study of qualitative and quantitative research about the container phenomenon. 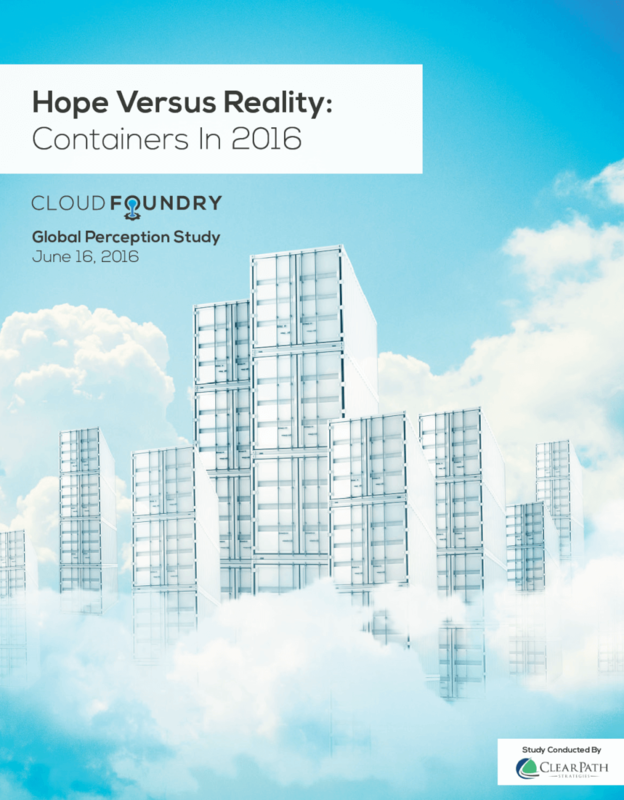 The resulting report Hope Versus Reality: Containers in 2016 details trends in container usage unveiled in that study. We invite you to share your feedback with us by emailing our senior marketing director, Devin Davis, at ddavis@cloudfoundry.org. Enter your email to get the report. You agree to receive updates from Cloud Foundry Foundation, and can opt-out any time.